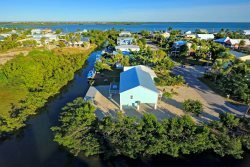 Located in a nice, quiet area of Big Pine Key this ground level 2 Bedroom / 2 Bath home is super clean and loaded with charm. You will be so comfortable and cozy here, you won't want to leave. Nicely furnished inside and out with tile floors and a screened porch to enjoy your morning coffee and watch the fish jumping in the canal. Bring your boat! Our 75' concrete step-down dock makes boating easy and fun. Guests are welcome to use our 2 canoes and tandem kayak for their enjoyment. Just a short ride out to the open water for fishing, diving, and snorkeling. Be sure to visit the famous No Name Pub just up the road. It is the oldest bar in the Keys offering delicious pizza, and a variety of tasty items on the menu. Watch for the Key Deer that roam freely in the area. Close to local shopping, restaurants, tiki bars and area attractions. Spend a day on one of the local charter boats for fishing, diving or snorkeling. Take a trip down to Key West for the Sunset Celebration or a romantic Sunset Cruise. Or visit one of the many venues offering the finest in live entertainment and great food. Be sure to take a stroll up and down Duval Street and visit the art galleries, shops, and more.